Falafel are one of the few take-out foods that do not taste good reheated. They tend to dry out and become overly mealy when eaten the next day. So what to do when you’ve got leftover falafel sitting in your fridge? 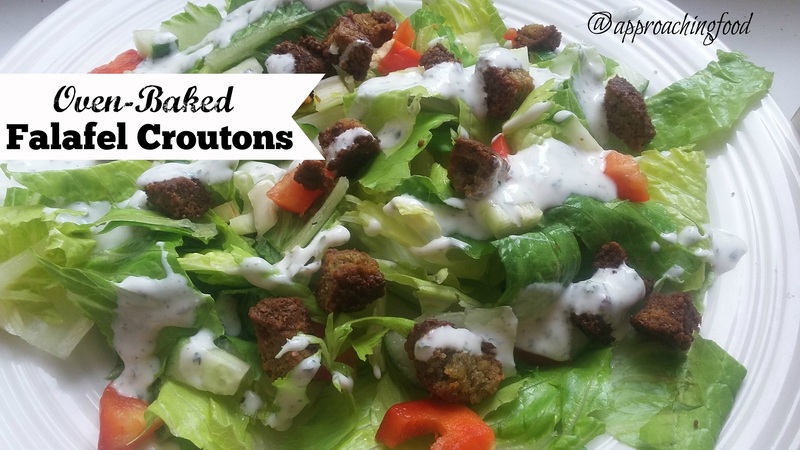 Make falafel croutons, obviously! I tend to eat a lot of salads for health reasons, and I like to switch up the toppings to keep things interesting. I’m also always in search of ways to add vegetarian protein to my diet. And then last week the DH and I ordered takeout from a local Middle Eastern deli, and ended up with leftover falafel. I opened my fridge the next day and looked the head of lettuce sitting on the shelf. I looked at the stale falafel in its wrapper. A light bulb went off in my head, and bam! Falafel croutons were born! Chop falafel into cubes. Toss with oil and seasonings. Bake in a 400 degree oven for 10 minutes, flipping them over after 5 minutes. And…you’re done! That’s right, these croutons bake up in the time it takes to chop up your salad. I made them with purchased falafel, but they could easily be made with homemade falafel. Probably healthier that way, anyway. The two falafel will actually be enough for two salads. Unless you prefer to snack on the croutons like popcorn, which is actually not a bad idea. As I was finishing up the salads (topped with my fave ranch dressing) the DH came into the kitchen and started nibbling away on the croutons. His reaction? “MMMM!” and then, “Why can’t you make crappy food?” I must have looked a bit taken aback, because he clarified: “Why do you always make such delicious food? I’m going to gain weight!” A bit of an awkward compliment, but I’ll take it regardless! All of which is to say, falafel croutons are YUMMY! Try making some yourself, and switch up the seasonings to suit yourself and/or your salad. Let me know what flavourings you think work best! Next Post: Coconut Buttercream Frosting, probably the best coconut flavoured food to pass your lips this year. Seriously good stuff! Also seriously easy, which means I am all over it! 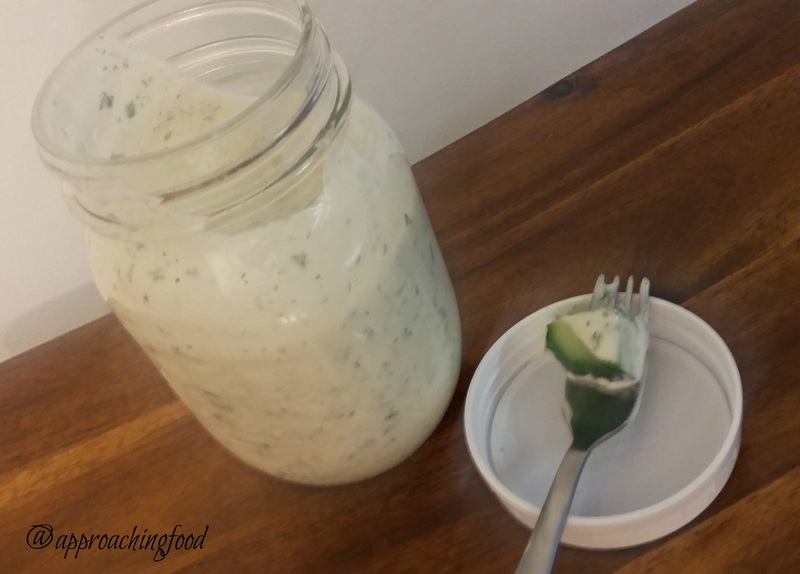 Linking Up at Meal Plan Monday! And at Happiness is Homemade! Plus, at Full Plate Thursday! 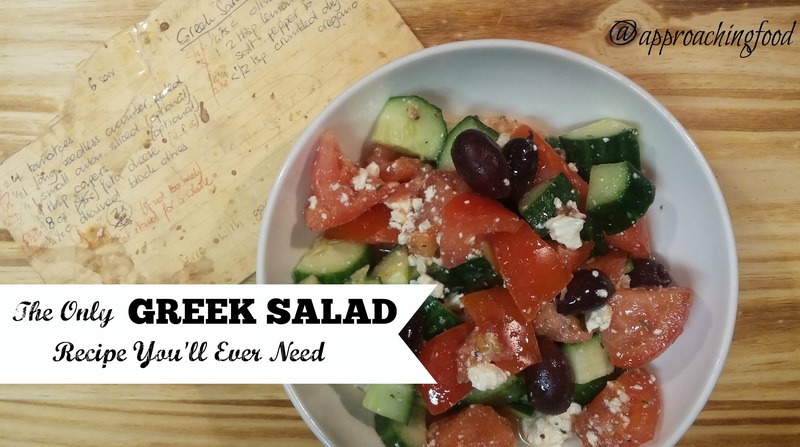 This entry was posted in Salads I Have Known and Loved on September 18, 2017 by Margaret. Good enough to eat all day! 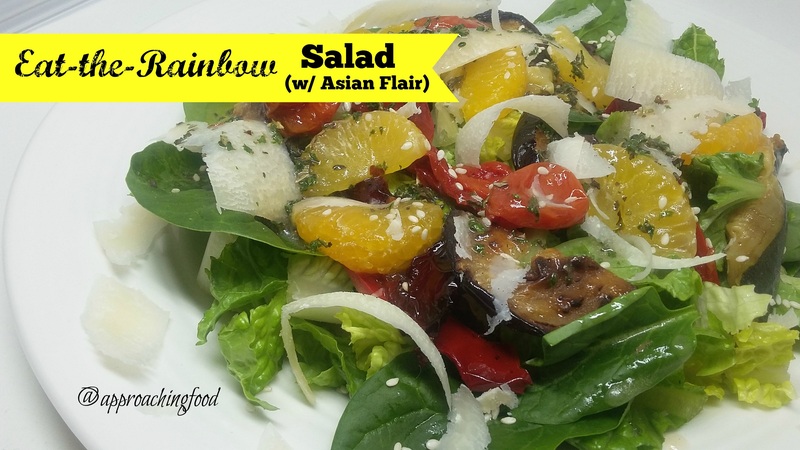 I had a hard time coming up with a title for this salad recipe, as I couldn’t decide to showcase the roast veggies in the name or to emphasize the (very mildly) Asian aspect of it. It’s a riff on a salad available from Panera, which is a soup-and-sandwich joint in my neck of the woods. A co-worker bought a salad from there for lunch one day, and it smelled so good that I had to replicate it on my own. 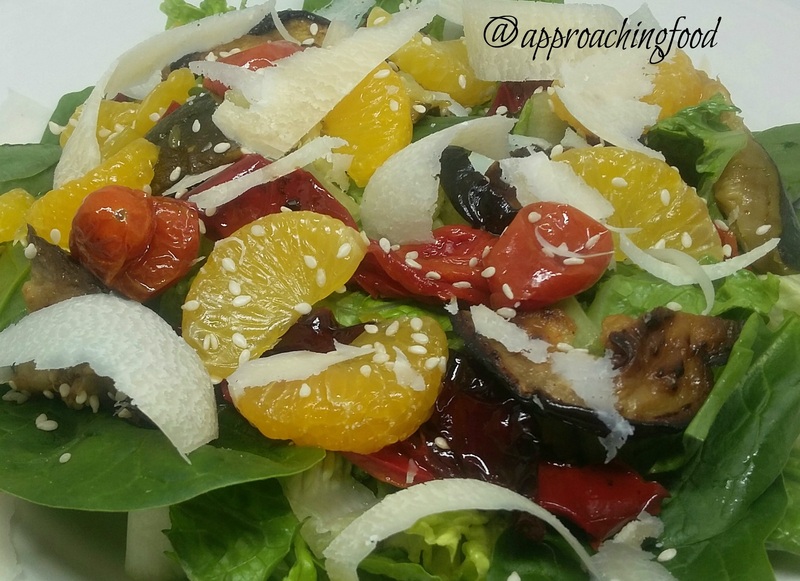 The salad base (as I re-envisioned it) is a mixture of romaine lettuce and spinach, which is then tossed with oven-roasted veggies, shavings of real parmesan, mandarin segments, and sesame seeds, and then finished with a homemade Italian dressing. The roast veggies are what take this salad to the next level — ever had eggplant, zucchini, baby tomatoes, all oven-roasted and tossed with slightly charred roast peppers? Oh, so good! If you’re thinking blech, roast veggies, then you DEFINITELY need to try this dish, as it will change your mind and make you a roast veggie convert for life! The roasting of the veggies caramelizes them and makes them soft and crispy and sweet and savoury all at the same time. I could happily eat roast veggies on toast with a dash of salt for many a meal (and have done so). But aside from tasting really, truly yummy, the dish is obviously healthy and a great way to get a whole lot of veggies packed into a single plate. So let’s make some! The first (and very important) step is to slice the eggplant into thin slices and salt them liberally. Stack on a plate and wait for an hour or so for the salt to draw out all the bitter juices. Then rinse off the salt and bitter juices. Place all the vegetables (except the lettuce and spinach) on two cookie trays, and put 1/4 c. of the oil on each tray. Toss veggies to coat. Bake in a 400 degree oven until crispy and golden, about 30-40 minutes, making sure to flip the veggies with a spatula halfway through the cooking. When you flip the veggies, brush the remaining two tbsp. of oil on the veggies. When fully roasted, the eggplant and zucchini will look golden and caramelized, the peppers will be slightly charred, and the tomatoes will look shrunken. Let cool. While veggies are cooling, toast the sesame seeds in a dry frying pan over medium high heat until golden brown (very quick). Let cool. Slice romaine and toss with baby spinach and mandarin segments. Divide over four plates and divide veggies and place on top. Sprinkle sesame seeds on top, and top with parmesan shavings. 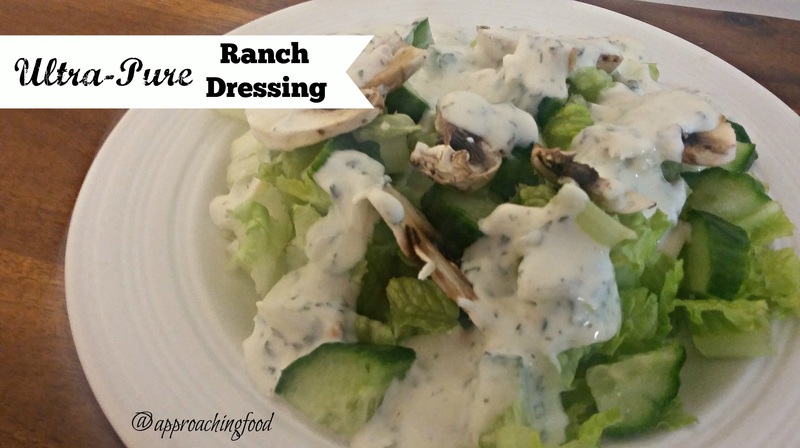 Add dressing of choice. This salad is SOOOOO good! I served it for dinner this weekend, and while it looks all healthy and light (and is! ), it was also enough to keep my taste buds happy and my stomach full. I imagine it would taste even better with a sweet onion dressing, and plan to try that next time. I honestly didn’t think roast veggies would go well with mandarin segments, but it really, truly does. Plus, the vitamin C in the mandarin segments helps your body absorb the iron from the spinach, so win-win! If the health benefits of this salad don’t convince you to try it, do it because it just tastes so darn good! You’ll thank me, you’ll see! Next Post: Three-Ingredient Blue Cheese Pasta…or Strawberry Custard and Cream Cake? I’m leaning towards the cake because of my sweet tooth, but…I do like my carbs, so it’s a toss-up! Any preferences? Let me know in the comments! 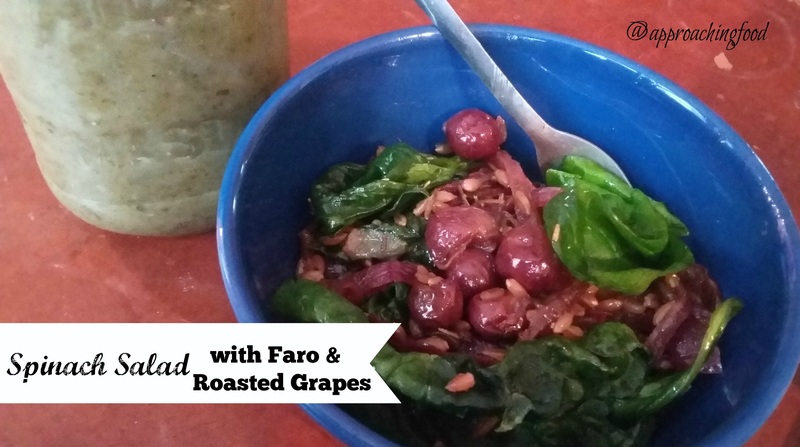 This entry was posted in Salads I Have Known and Loved, Vegetarian Main Dishes on March 6, 2017 by Margaret.